Had trouble catching bait this morning, could only catch very small baits. Picked clients up and searched for schools of fish and bait with little success. I knew it would be tough today due to the full moon last night with bait not coming to the lights and fish feeding hard the night before in the bright moonlight.We checked the areas that I caught fish yesterday with no luck. I decided to go to deeper flats in the 40' range and started hooking up. 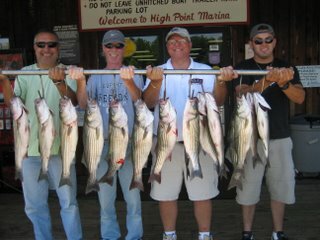 We ended up with over 100 hits catching 25 Stripers and 10 cats, clients keeping 14 Stripers for the day.